We enjoy going to our local farmers' market on Saturday. Although the market is open year round, the selection of vegetables and fruits is quite limited in winter. We bought some fresh carrots, parsnips, potatoes, garlic, basil and rosemary during our last visit. Yesterday, I used all these ingredients and made a very delicious side dish for dinner. Apparently, you don't need a fancy recipe to make a tasty dish when you use fresh ingredients. They can produce their own flavors. Adding too much seasoning may destroy the purpose of buying them fresh. 6 small red potatoes - 12 oz. Brush the bottom of a 9"X 13" baking pan with oil. 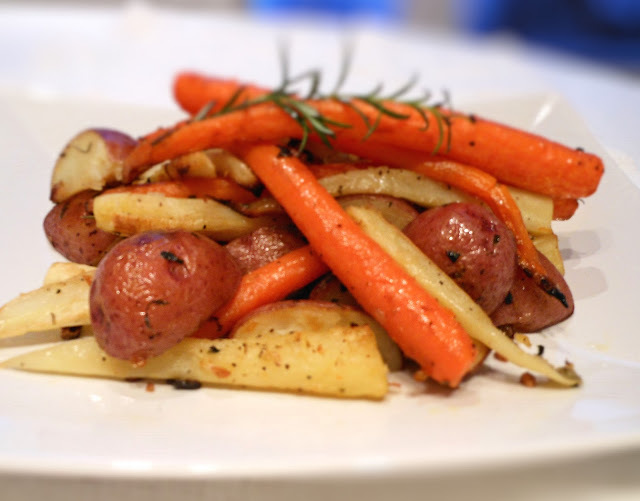 Peel parsnips and carrots. Cut parsnips in half crosswise, and then into strips lengthwise. Cut small potatoes into chunks without peeling the skin. In a large mixing bowl, toss the first six ingredients with butter and olive oil until evenly coated. Transfer to the greased baking pan. Bake for 30 to 35 minutes or until tender. Toss once during baking. Hi Evelyn! 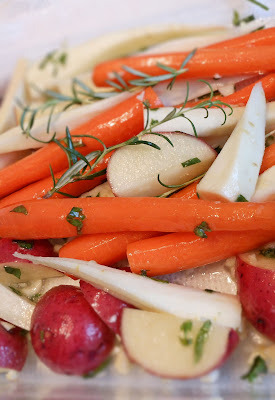 I love roasted veggies but I've never roasted parsnips! If my translation is correct, parsnips is something we eat Japan, but we usually makes for salad or pickles. I'd love to try roasting it - I wonder how it will turn out. Thanks for the great idea. I need to go find parsnips next time I go grocery shopping. It's been so cold and roasted vegetable sounds wonderful! Nami, parsnip tempura is also good too. I'm a big fan of tempura!